Hello readers! Vince here with another late card review. This time, I rewind myself to a card from the Black and White series: Blastoise (BW Boundaries Crossed 31/149, BW Plasma Storm 137/135, BW Plasma Blast 16/101)! A bit of trivia is that this is the only Stage 2 Blastoise card in the entire Expanded card pool. And yet, it’s the only good one because of what this card does. It has been reviewed twice by the Pojo crew as the third best card of the set and as a regular review almost one year after the previous review. It could’ve been one of my personal picks of the top 10 cards lost to rotation in 2015 if I volunteered. This Blastoise seems to pay homage to the very old Blastoise card from Base Set, as it possesses identical effects like the older card, in terms of abilities and attacks. Deluge is Rain Dance in another name, but still lets you attach as many Water energies from your hand to your Pokemon as you like, easily fueling attacks that need Water or Colorless Energy requirements. 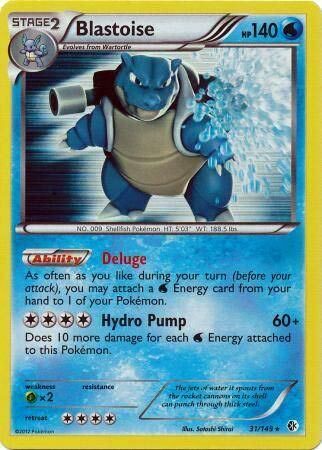 Hydro Pump is also a recycled attack that cost CCCC for 60 damage, plus 10 more damage for each water energy attached to this Pokemon. With a minimum of WWWW, it makes that attack do 100 damage, which was enough to 2HKO at the time, with Weakness being an OHKO on any Pokemon whose mostly Fire types and a decent chunk of Fighting types like Landorus-EX. Blastoise got to enjoy the years when it was Standard legal, mostly the 2012-2013, 2013-2014, and 2014-2015 seasons. Despite being printed three times, it didn’t save itself from being rotated in 2015 when expansions ranging from BW Boundaries Crossed and BW Legendary Treasures were about to leave. When it was released, it saw a good amount of play. Yes, it was a Stage 2, making it hard to get it into play, and even worse back then when players get to attack on their first turn…and possibly win before you get to do anything. Squirtle’s Shell Shield does help its durability by taking no damage when it’s on the Bench, though it still gets affected by damage counter placements. If it was your lone starting Pokémon, it can be KOed on your opponent going first by using Hammerhead backed with Hypnotoxic Laser and Virbank City Gym. So the ability is good, and while it can support its own, more often than not, you have other partners that can take advantage of this ability. Keldeo-EX (BW Boundaries Crossed 49/149, 142/149, BW Black Star Promo 61, BW Legendary Treasures 45/113) was released on the same set Blastoise was in, wielding its Rush In ability to maneuver your position as well as its own Hydro Pump that can scale even bigger than Blastoise, doing 50 damage plus 20 more for each Water energy attached to it. With a minimum of WWW, that makes it deal 110 damage. Another partner is Black Kyurem-EX (BW Plasma Storm 95/135) whose attack called Black Ballista that did 200 damage for WWLC, which was enough to OHKO almost all of the Pokemon at the time. The three energy discard can hurt, but with Deluge and Superior Energy Retrieval, you can get to use Black Ballista turn after turn. Obviously, the amount of support Blastoise provides isn’t limited to just those two cards, any Pokemon can fit the bill. It’s just that Deluge has an impact of those Pokémon, and it comes down to who is he best attacker that can benefit from that ability. Later on, Blastoise gains a trick that makes it so that it doesn’t need the lower stages: Archie’s Ace in the Hole. This Supporter works only if this is the only card in your hand, because if it is, then you put a Water Pokemon from the discard pile onto your Bench…and draw five cards. This saves deck space by a lot as opposed to using the entire line. Sometimes, it may be tricky to pull off, but with a variety of cards such as Ultra Ball and Dowsing Machine that can help reduce your hand size down to one card, the requirement becomes somewhat bearable. Since then, Blastoise is used without its lower stages due to Archie’s Ace in the Hole. And it finally made a showing as a sendoff in one of the 2015 World Championship deck called HonorStoise by Jacob Van Wagner. It won first place in the Masters Division. So Blastoise rotated out in 2015, how does it fare in Expanded? Well, looking at Limitless, there were five placings regarding Blastoise, and all five were under the variant of Archie’s Blastoise. This seems quite fitting, as it contains both Archie’s Ace in the Hole and Blastoise in a deck, while supporting a wide assortment of attackers like Articuno with the Delta Plus Ancient Trait, Kingdra-GX, Keldeo-EX, Palkia-GX, and even Wishiwashi-GX. The highest placing out of the five decks were 3rd place while the lowest was 61st. I don’t know how many years the database can store, but out of the five showings, one was from 2017 and the other four was 2018. Despite not making too many appearances, being placed pretty high on one of them means that Blastoise can still have an impact on the Expanded format. It is also legal in the Legacy format, a format exclusive in the PTCGO which allows expansions between the HeartGold & SoulSilver and the Black & White series. With that comes not only this card, but another older Blastoise card (HS Unleashed 13/95) that might accompany with this card. It brings a Poke-Power and an attack to the table. Wash Out Poke Power states that you can move as many water energies from your Benched Pokemon into your Active Pokemon. Hydro Launcher costs WWCC and lets you do 100 damage to any one of your opponent’s Pokemon…after you put two water energy attached to it into your hand. That makes Mewtwo-EX not punish you as hard and you can easily reattach those energies back on the old Blastoise next turn. Pokemon Powers are completely unrelated to abilities and thus can’t be turned off from Garbodor’s Garbotoxin. Which brings me to a competitor of Blastoise: Feraligatr Prime (HeartGold & SoulSilver 108/123). It has a Poke-Power called Rain Dance that can attach as many water energies…to Water Pokemon only, which could be quite restrictive. You decide if you want flexibility from Blastoise, or Feraligatr’s Poke-Power that won’t be disabled. Though if you have room for Tool Scrapper, you can simply get rid of a Pokémon Tool from Garbodor to reactivate your Blastoise’s ability again. 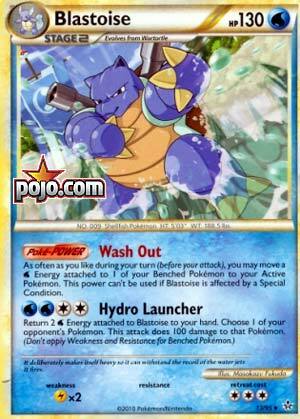 Blastoise also appears in the Ice Shock Theme Deck as a single copy, so it may risk being in the prize pile. Unfortunately, this theme deck is lackluster due to lacking a good amount of decent cards; just two Cheren and one Skyla isn’t enough to dig through your theme deck. So while Blastoise is a good card, the entire contents of this Theme Deck lets it down. Blastoise also appeared in the Battle Arena Keldeo-EX Deck, but because it isn’t considered to be a Theme Deck, I won’t include it. 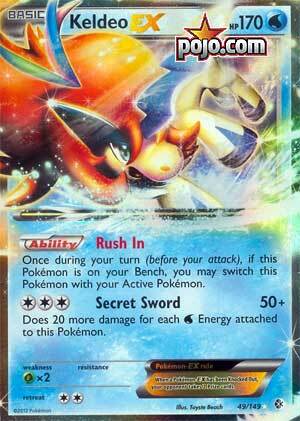 This Battle Arena Decks – and other decks before and after it – contained cards that can be considered tournament worthy, as it contain staples from the XY series such as Professor Sycamore, N, VS Seeker, and much much more. It is also a pain to use in Limited because not only you have to pull the entire evolutionary line in six packs, but you would have to draw into those cards and hope that one of them is not prized. If you do get them out, then the attack cost won’t matter at all; you can easily attach WWWW and swing for 100 damage. Conclusion: Blastoise has a rich history, and will continue to perform well as years keep passing by. It’s only edge over other type specific energy accelerators was Archie’s Ace in the Hole, which lessens the need for lower stages.